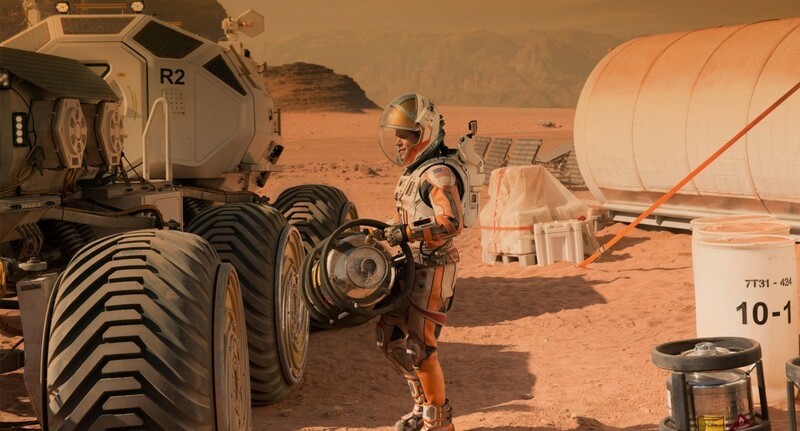 Review of Ridley Scott’s 2015 film adaptation of Andy Weir’s novel The Martian. Starring Matt Damon, Jessica Chastain, Kristen Wiig, Jeff Daniels, Michael Peña, Kate Mara, Sean Bean, Sebastian Stan, Aksel Hennie, and Chiwetel Ejiofor. Vast red landscapes, unwavering humour, and intense breath-holding disasters. The Martian takes inter-planetary travel, makes it deeply personal, and holds you captive for two-and-a-half hours of gripping story mixed with phenomenal visuals. By no means an exact adaptation, Scott’s The Martian stays very true to Weir’s novel adding another must-see movie to the ever growing list of superb 2015 films. I went into the screening[^fn1] excited to see how Scott had transformed the novel. I was also apprehensive for how the written logs and pages of explanation would be transferred to movie form. One thing I love about Weir’s book is the exploration of how the main character, Mark Watney [Damon], made decisions and drew conclusions based on both his vast knowledge combined with an unapologetically dry wit. With limited exceptions I am pleased with Scott and Damon’s on screen rendition of this. 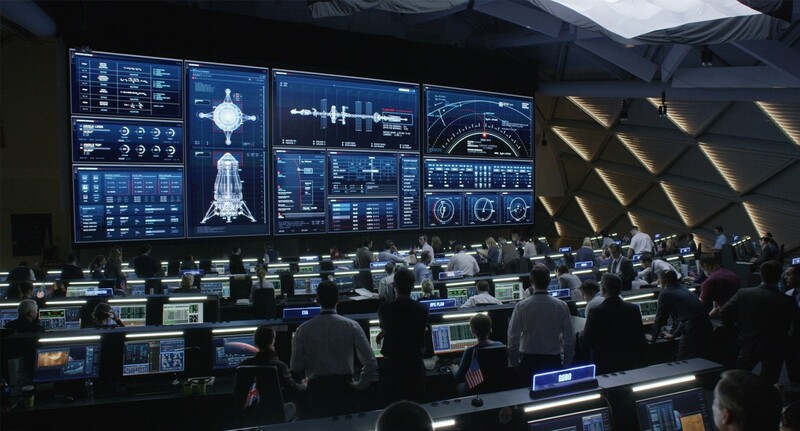 Following some beautiful cinematic shots of Mars[^fn2], the film opens with the crew of Ares 3 (the third manned mission to Mars) performing their daily duties. We are introduced to the entire crew and their dynamic. 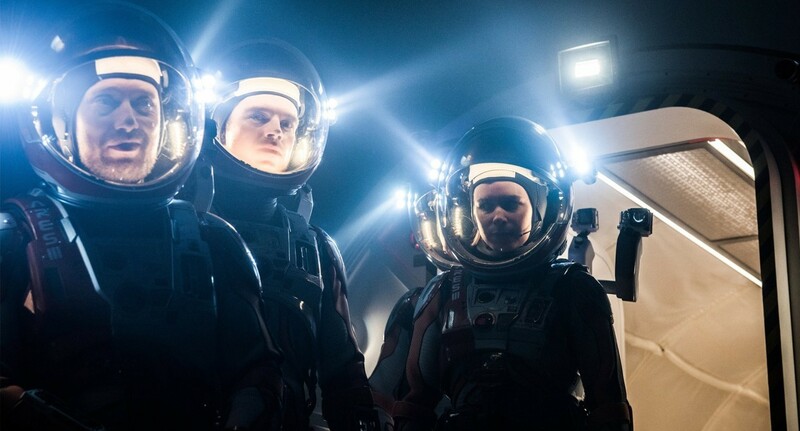 Within a few minutes of the opening title a massive storm forces the crew to evacuate Mars. Just as they are fighting their way through the winds to the MAV[^fn3] Watney is hit by flying radio dish and lost into the storm. The crew, time constrained by the wind tipping the MAV, search for him but ultimately must leave him behind assuming he is dead. _The Martian is Mark Watney’s story of surviving on Mars when no one knows he’s alive. He sets about healing himself and starting a plan to ration out enough food to last until the Ares 4 mission in four years time. Going about his duties, setting up a small potato farm, and calculating the distance to the Ares 4 landing site, Mark both talks to himself or records video logs (in case someone one day finds them). This allows the audience to create a rapport with the character in what could have been an otherwise very silent film. As the film progresses and Watney becomes more accustomed to talking into GoPro-like cameras mounted all over the Habitat, the number of jokes increases. Watney explores issues of existence and isolation through humorous anecdotes and dry wit. Realising that legally Mars comes under maritime law, Watney is quick to name himself a space pirate (he is planning to use the Ares 4 MAV without permission). While Watney is trying to survive on Mars, a parallel story starts at NASA headquarters. Shortly following the funeral, NASA finally decides to fly a statelite over the Ares 3 site (something they’d been avoiding for fear to publishing photos of Watney’s body). They quickly discover that the rovers had been moved and the solar pannels cleaned. NASA puts all its efforts into trying to contact Watney and find ways of helping him survive the next four years. After contact is made the stories become one, Watney and NASA come to be on the same page. Helping Mark through the plans they’ve devised, things are looking up. 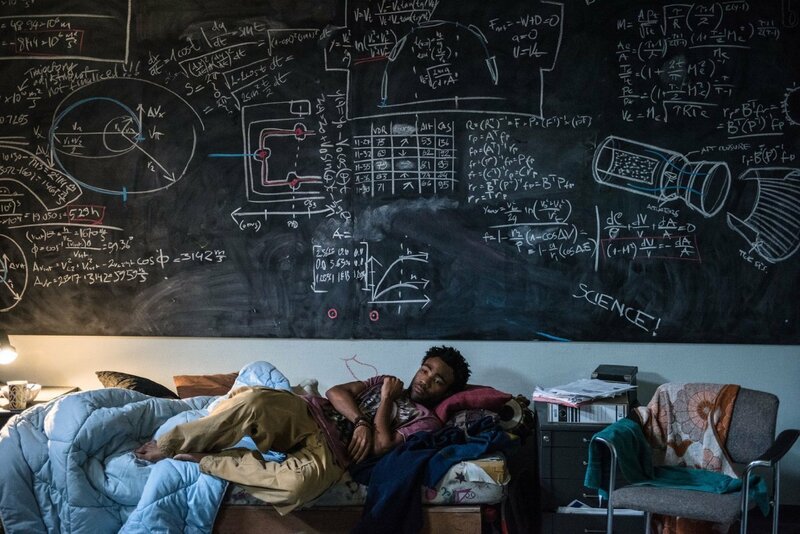 The film becomes a story of science breaking through ranks, and humanity’s desire to be good to one an another. Almost everything that can go wrong does. From explosions to cracked space suits, to more explosions Scott shows that at any moment the hostility of space can and will try to destroy you. And that humour and science are the best weapons against it. With that said The Martian does deviate quite significantly from the novel at times. The most notable differences come in the form of less problems and heroism for movie audience. A good portion of the story is excluded from the film. This is obvious when you think about how even with the story cut down, Scott’s version comes in at just under two and a half hours. Scott excludes a reasonably slow section of the book (that I assumed would have been a montage when I first read it) and thus excludes a few more of the “everything is going wrong” scenes[^fn4]. It’s understable but a shame that does mean the audience looses some of the feeling that Mars really is trying to kill Watney. While tonnes of things go wrong, the film never felt like as much of an uphill battle as the book. The other noticeable change is with the characters’ actions. An important action performed by the Ares 3 crew is switched between two of the characters in the adaptation. My naive reasoning for this is because the action moved from a lesser known actor to a bigger name. While the decision didn’t impact the story at all, it did influence how I read the characters between the book and film. An unimportant difference, but a difference nonetheless. Matt Damon was not the first person I thought of as playing Mark Watney when I read Weir’s novel. I was rather sceptical of if he could portray the smiling-in-the-face-of-ultimate-lonelinessscientist. Damon does an excellent job. The character is close enough, yet not identical, to the novel’s Mark Watney that I instantly came to like him. I also very much enjoyed Benedict Wong’s character, the JPL (Jet Propulsion Laboratory) engineer Bruce Ng. Wong encompasses an “all round knows what he’s talking about”, but also “knows how to take the piss”, engineer. He can communicate with both Jeff Daniels’ Director of NASA and low level JPL scientists with the same level of humour. All up Scott did an excellent job casting The Martian_. Every actor delivered a great performance that effectively adapted their written cahracter to a cinematic medium. Much of that credit must go to Scott and his ability to get the best out of any actor. However, due to the nature of the book to film conversion, many of the characters lost out in depth. I saw the film in 3D and am so glad that I did. 3D through the years has been a bit of a hit and miss, for many James Cameron’s Avatar was the last film they saw in 3D. The Martian should be viewed in 3D. From the vast expanses of Mars’ landscapes to the intimate close-ups of Watney, the 3D is used so gracefully as to enhance and never detract from the story. Most of the film is red (rather obviously) in tone. Most of the NASA sequences are blue in tone. 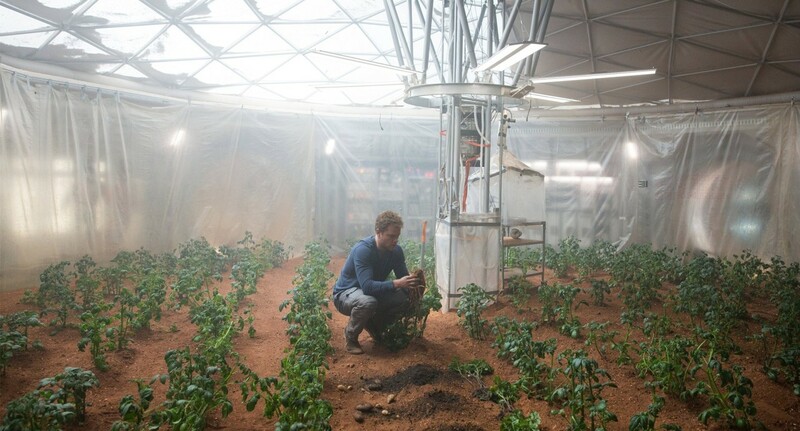 The colour green features once; while Watney is growing potatoes in this habitat. This select use of colour really highlights just how foreign, how distant and hostile, Mars is from Earth. The blue tones of NASA show that while they are on Earth they too are far removed from the grass covered hills that everyone else outside experiences. Scott creates isolation amongst the Earth bound characters as much as he does amongst those twelve light-minutes away. The visuals are so detailed you wouldn’t once think that maybe this might not actually be filmed on Mars. Despite everything that goes wrong with Watney and the Ares 3 mission, I want to visit Mars. Especially if accompanied by Harry Gregson-Williams Score (and maybe a few of Commander Lewis’ [Chastain] disco music). 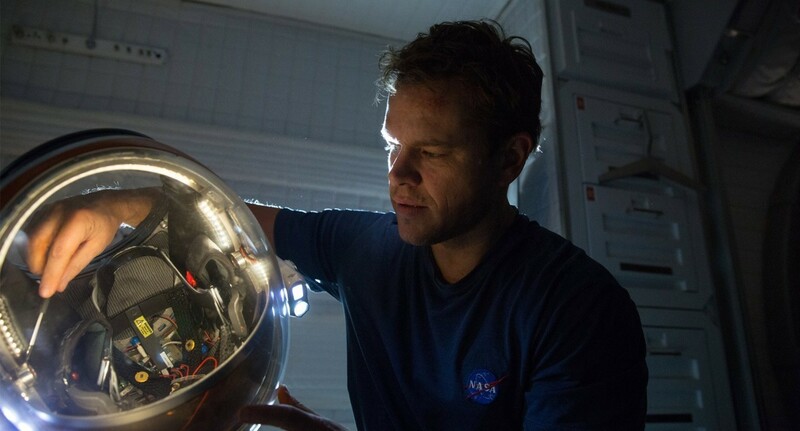 For a lost in space sci-fi movie The Martian is remarkably bright and welcoming. Even the night scenes and outer space scenes with the rest of the Ares 3 crew still feel uplifting. 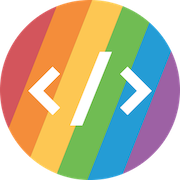 > Bright, thematically can-do, fast-paced almost to a fault, and fundamentally optimistic … We will solve this daunting problem by working together, it coos. Scott, using Weir’s story, has made a film in which the entire audience and world are rooting for the survival of a single person. This is Damon’s show. I found myself less invested in his pain than the paper Mark Watney, and yet still cared so much about his survival. Comparable to Castaway only in premise, The Martian is about thousands of people coming together and (literally) putting international politics aside to solve a common goal. The goal of ultimate survival. At times you question the billions of dollars being spent on the saving of a man already once thought to be dead, but in the end you see that humans will stop at nothing to save someone. 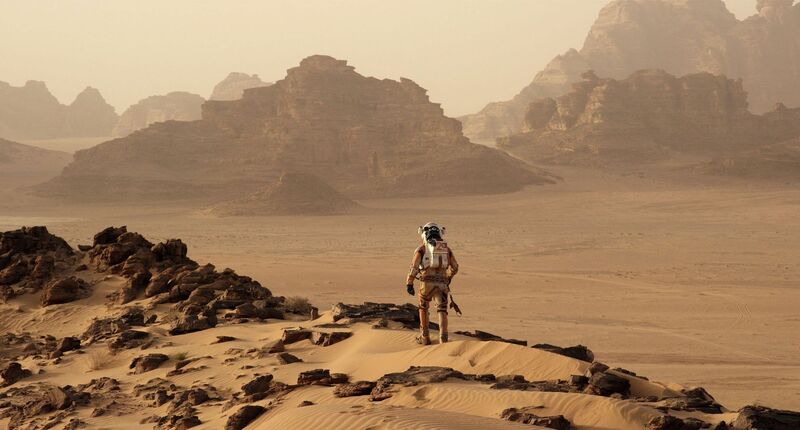 If you only saw one movie this year, I would not make it The Martian (Mad Max still takes that cake). If you see two, make The Martian the second. While you’re at it, pick up a copy of Weir’s novel1. I honestly don’t think it matters which order you read/view them in, you will enjoy it no matter what. Also, Sojourner is the cutest extra-terrestrial vehicle we as a planet have ever made!